In music, there are two main ways of composing music. You can either begin with the melody or begin with the harmony. If you're curious to learn about harmony then visit Beginner's Section Introduction. You are the creator of the flower and you have two options. 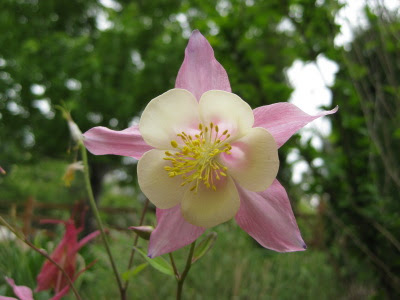 You can either start the flower creation by initially forming the stem, or you can first build the bud. Harmonic composition is the art of creating an interesting chord progression to accompany a melody. In harmonic composition the chord progression would come first. For instance, someone might compose the piece below, and add on a melody later. The harmonic method creates a framework for the composition and gives structure to the piece. Many popular song writers use the harmonic method for composing because it is much easier than the alternative melodic approach. The harmonic method is a great way to ensure your compositions are uniform throughout. However, if the harmonic chord progression is obsessively used for the song, the song can become boring. Consequently, it is a good idea to vary the harmonic chord progression throughout the song. Start with one chord progression, and then vary it up. The harmonic method also limits what you can do with the melody. The melody is based on the harmony in the harmonic method, rather than the harmony being based on the melody. This creates a danger of constricting the melody. Even with the risks entailed with the harmonic method, numerous songs have been successfully composed using it. Melodic composition is the art of creating an interesting melody without any restrictions. Once the melody is finished, the harmony is added. For example, one might have composed the melody below. This approach allows for more freedom in your compositions but leaves you with the difficult task of finding the right harmony to accompany the melody. There are numerous ways to accompany the melody above. Finding the chord progression that fits the song can be a difficult task that can be eliminated if you use the harmonic approach.